Speaking of filling vacancies, we just gave new tenants keys to Villa Park A! It looks much nicer now with the plants trimmed a bit, but Sue Ann forgot to take a picture yesterday. This post is another segment in the unofficial series “What Makes a Good Deal.” Today I’ll talk about an obscure statistic called Debt Coverage Ratio (DCR). DCR describes the ability of an income property to pay for itself and pay the owners a premium for managing it. It comes from the commercial real estate market, but I like to apply it to the single-family market. After all, renting houses is a commercial venture. Gross Potential Rental Income is the amount you would make if all units were fully leased at market rent. You will seldom realize this number, because you’ll see at least some vacancy and market rents tend to vary over the year. For example, you have a house that you could rent today for $1200 per month (GPRI=$14,400). Your current tenant pays $1100 per month ($13,200 actual). If that tenant’s lease renews, you must decide if bringing the rent to market is worth the potential vacancy expense ($1100 if you can get a new tenant in place in one month) plus the cost of renovating the unit. 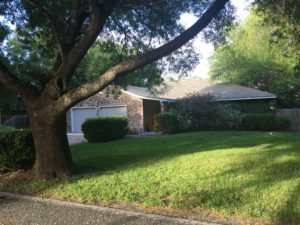 Net Operating Income of the property is the GPRI left over after paying for the operating expenses such as taxes, insurance, vacancy, and maintenance. It does not include the reserves for capital replacement (although you should definitely have them) or debt service. Debt service is the total amount of money required to satisfy all lenders. If you have both a mortgage and a home equity line of credit (HELoC) on a single-family dwelling, DS is the total monthly payment required for both notes multiplied by 12. To calculate DCR you divide NOI by DS. When evaluating a potential investment, multiply the monthly pro forma NOI by 12. When evaluating an investment you currently hold, use the actual NOI for the last year. Repairs – 750 Even if you’re leasing new construction, something will break. Vacancy – 600 Plan on at least a couple of weeks of vacancy each year. You may need more in some markets. And don’t forget about commissions and advertising. I’m using $600 for vacancy because I’m assuming one month vacant for every two years, or a 95% occupancy rate, which is pretty close to what my single-family properties average. Multi-family properties are considered “stable” at 90% occupancy. Just looking at the numbers on this example, you can see I wouldn’t be getting rich from it, unless I were banking on appreciation. Dividing the NOI ($8,364) by the DS ($8,000) I get a DCR of 1.05. That means for every dollar of debt the property pays, I would get to keep a nickel. But if you look at the current actual rent ($13,200), the NOI is $6,004. DCR becomes .75. Now I would have to kick in a quarter for every dollar of debt service. Ouch! On commercial investments, lenders expect DCR to be at least 1.25. You should be able to keep a quarter for every dollar the property pays in debt service. That is a reasonable expectation even on single-family rentals. Luckily, I can turn the formula around to cipher how much rent I need to achieve that goal. If I want a DCR of 1.25 on the $8,000 annual debt service, I would need a $10,000 NOI. Assuming the other expenses stay the same, that means a GPRI of around $18,000 or $1500 in monthly rent. That’s $300 a month more than current market rent and $400 more than the property currently generates. If that increase isn’t reasonable, I need to either walk away from this opportunity or find a way to force appreciation by spending more money to improve the property to make it attractive at the higher rent. This house is pulling itself apart as parts of its floating slab foundation move in different directions, like continental drift. There’s a fine line between buying too high, buying right, and losing the deal. We lost another deal today by only a few hours. There was a REO (Real Estate Owned—it’s a banking term that means the bank owns the property after foreclosure.) house in the same neighborhood as the Ash House. We had been keeping an eye on it for a while, but the bank wanted too much money for the shape the house was in. We kept submitting offers over time in hopes of eventually landing this deal. Even though the bank had steeply discounted its original asking price, the discount wasn’t sufficient to cover the cost of repairs. The roof was past its expiration date, and the foundation had problems. A floating slab foundation built in the 60’s on highly mobile soil will eventually fail. It’s just a matter of time. When it does we can repair it and bring it to today’s state of the art, which has improved dramatically over the last 50 years. The picture to the right shows several red flags that indicate a higher than average repair cost. 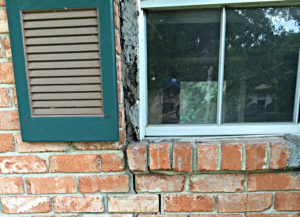 The foundation has cracked and is pulling parts of the house in different directions, resulting in the crack running down the wall. This has also let water get into the wall, which exposes you to rotted studs at best. 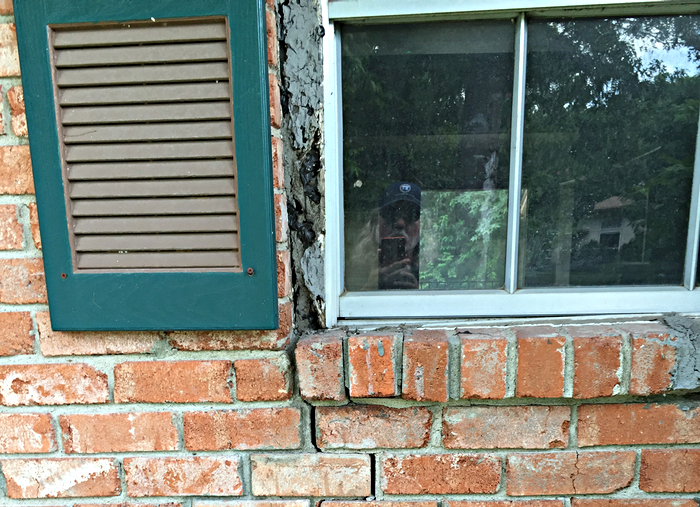 The window framing has failed, which also lets water into the wall. The problem was that our offer came in two hours after the bank accepted another investor’s offer. We don’t know what that offer was, but we were told ours was “in the ballpark.” Timing is everything. You snooze; you lose. Yada, yada—just keep working to find the next one.